The Column system of layouts dramatically showcases your collection. Emphasizing large images, this layout lends itself to a bold visual display. Scroll left to right and tap on a panel to dive into interpretive content. Seemingly simple, this layout has many design configurations that allow for unique and exciting digital experiences in-gallery or online! The Column layout easily orients the visitor around topics, themes and processes and entices the visitor to dive deeper with colorful and intriguing imagery. 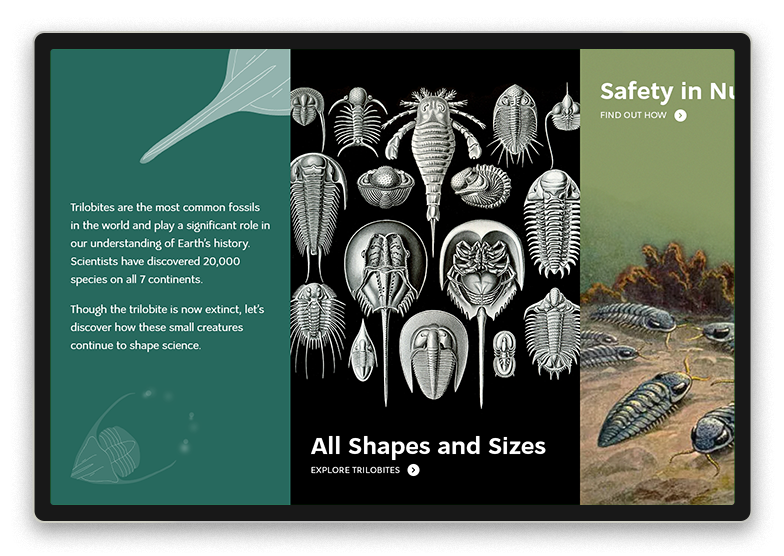 Like many museums, natural history museums have density of content so we’ve used the column layout to explore the evolution, behavior, and extinction of trilobites. Configuration notes: Features a 30% width intro panel, 40% width columns, alternating position of titles at both the top and bottom with transparent text background seamlessly overlaying the column image. 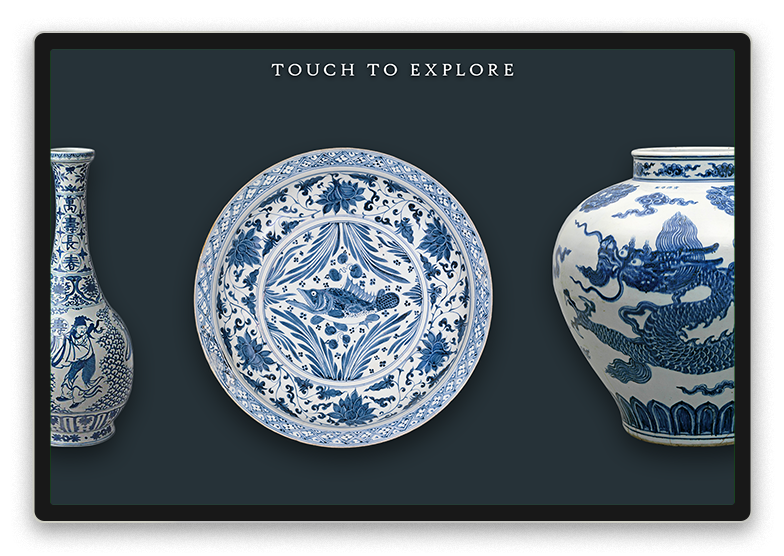 Wow your visitors with this simple, yet stunning display by letting your collection objects speak for themselves. With navigational elements and text minimized, focus on intuitively swipe left-right or tap an object to explore more. Configuration notes: No intro panel or column titles, but rather 35% width columns. Each image is prepared with the same background color and shadow treatment giving the objects a three-dimensional quality, as if they are floating on the screen. 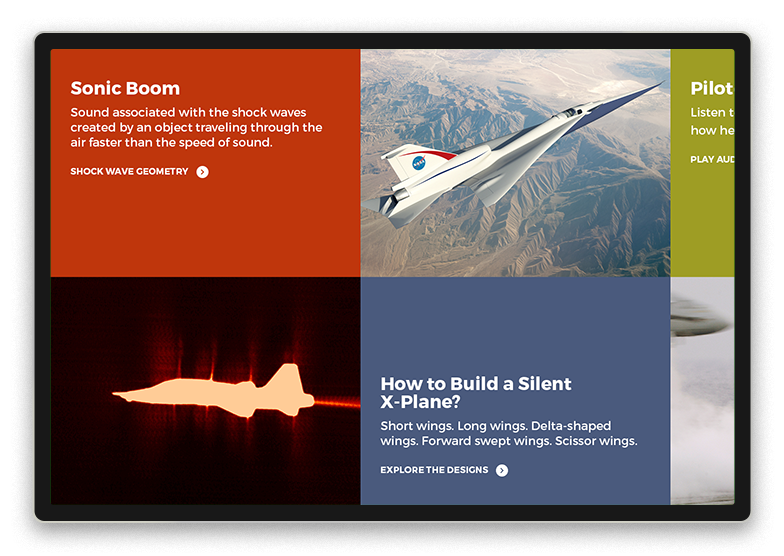 Help visitors discover the evolution of scientific advancements from understanding the science behind the sonic boom to how aerospace engineers are eliminating it through aircraft design. Each column introduces a topic and imagery while encouraging deeper exploration with a tap. Configuration notes: Features 45% width columns and no intro panel. Alternating top and bottom positions, the text fields have 50% heights and solid color backgrounds that overlay the column’s primary image. 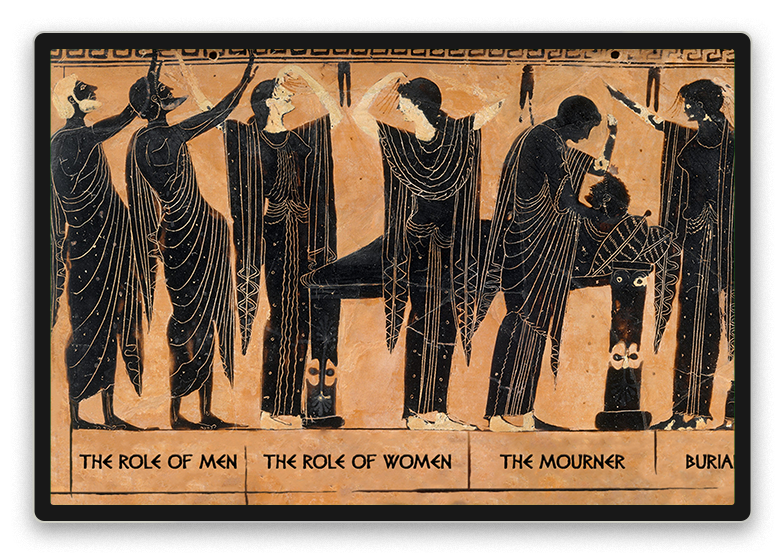 Plaques, friezes, urns, and tapestries often have flat linear depictions of scenes and characters. Each vignette’s iconographic, social and aesthetic interpretation makes sense of the whole. Configuration notes: Features columns of varying widths to line up with each notable section of the plaque. An image of the plaque was cropped for each column and small design elements were added to the bottom giving the appearance of lines. The text boxes are transparent and positioned at the bottom. 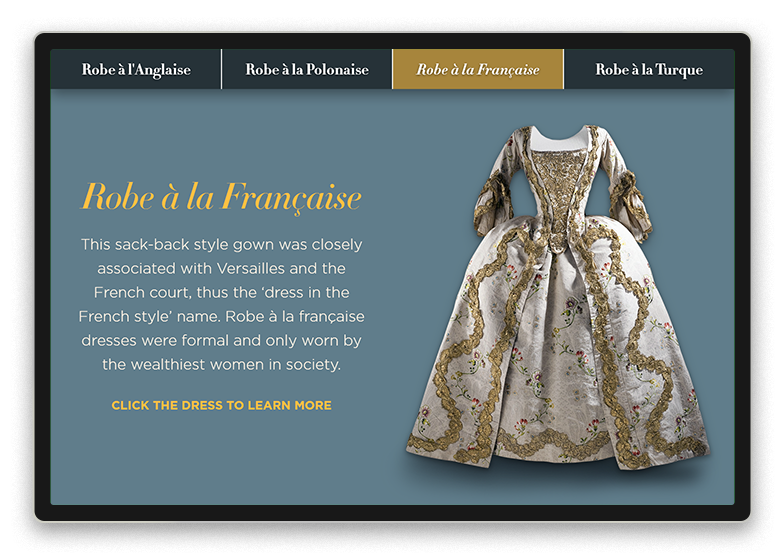 While four dresses are featured along the top navigation, just one column is needed to dramatically display this period costume. The intro column provides general context, but for those who want to learn and see more, they can tap the dress. Configuration notes: Features a 50% intro panel, only one 50% width column and is set to fit-to-screen. The dress is photoshopped with a shadow and a matching background color to that of the intro panel. Ditch the RFPs. Meet the Enterprise.